We recently celebrated July 4th in The Peace Arch City with a noteworthy parade, street fair and fireworks display. Across America people gathered sharing comparable activities in group celebrations honoring our national heritage. Now that this event is over the flags and band stands have been taken down and stored until the next occasion. On Memorial Day military veterans from this area gathered to honor men and women in our armed services who have died while implementing our country's political and economic objectives upon another government, homeland and civilization. Memorial Day and Independence Days are necessary to ratify publicly that we as a country do have agendas and motives. We conceive supportive rationale to justify our every action and eventual outcome. 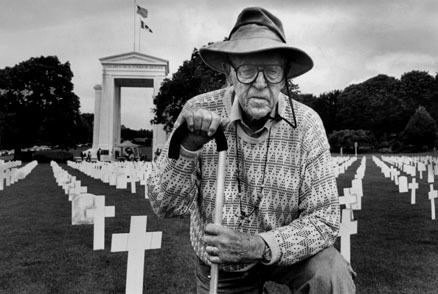 Retired major Arthur W. Dubois knelt down inside rows of remembrance grave markers demonstrating his hopeful desire for peace and an end to all unnecessary killings. We comprehend that true peace is not possible until each person vows to not murder another person...ever. Further, we must not condone media supportive justifications for any terminal or destructive aggression.